Spend a few hours getting to know some of Rome's public squares and famous fountains with this private walking tour. 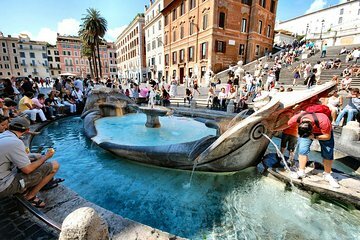 Begin the tour at the Spanish Steps to learn about the Barcaccia fountain at the base of the stairs. Walk next to the Trevi Fountain to hear stories you've probably never heard about this famous fountain. Visit the square and fountain in front of the Pantheon next, followed by the oblong Piazza Navona. Learn about the ancient Roman circus that once circled what is now the piazza, giving the 'square' its particular shape. Admire the impressive Fountain of the Four Rivers in the center of the piazza with its sculptures by Gian Lorenzo Bernini, as well as the church facade designed by Francesco Borromini and Girolamo Rainaldi. Walk to the Campo de' Fiori, home to a bustling outdoor food market since 1869. Continue to the Sacra Area di Largo di Torre Argentina, with ancient Roman ruins below modern street level – this square is where Julius Caesar was assassinated. Make your last stop at the Vittoriano monument, built to commemorate when Italy became a unified country.